Which terms are you on? Billy Bragg’s music is back on MySpace, and we should all be pleased. 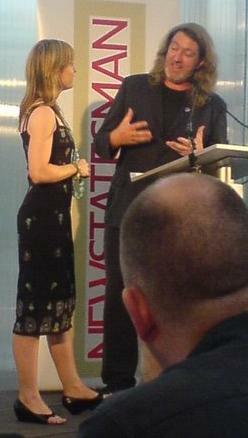 On Monday I was compering the New Statesman New Media awards, which took place in the bubble that is the current pavilion at the Serpentine Gallery. Lots of fun was had, and David Miliband’s remarks were witty and entertaining, something we rarely get from a Cabinet minister. About two weeks ago I started getting a lot of bounced emails. Most of them were notifications from the ‘postmaster’ somewhere that my email could not be delivered because the recipient didn’t exist, but quite a lot were from spam filters to tell me that I’d sent messages that they weren’t willing to accept. It seems I’ve been pushing stocks in dodgy companies, offering pharmaceuticals without prescription and even sending virus-laden images to unwitting users. Earlier this month the Association of Indepedent Music had one of those roundtable debates that industry bodies are so fond of. 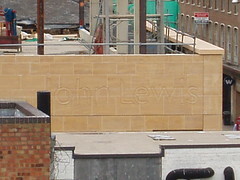 Taken from the roof of the arts picturehouse, this shows the sidewall of the new Robert Sayle department store – except they are going to call it John Lewis when it opens in 2008… we must stop this!